What, in this era of declining faith in our national institutions, a world in which a 2018 Gallup poll reported that only 5% of the country reported that they had a “great deal” of confidence in Congress, can be relied on? I mean really relied on, the way that Americans of yesteryear could rely on the Westward course of progress, or the unwavering service of their village aldermen? 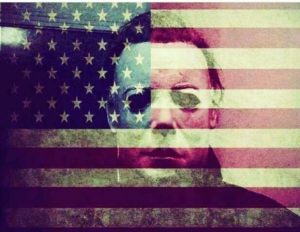 The answer, of course, is that we can rely on the murderous rage of cinematic psychopath Michael Myers, and on Hollywood to make a movie about it every few years. Its up to us to choose whether that is something to be concerned about, something to be comforted by, or both. If you’re a fan of 80s horror franchises, or milking intellectual properties, as I am of both, than you’ll take comfort. And particularly if you’re a fan of the “Halloween” franchise. Because lets face it, most of them haven’t been great. Remember when Michael Myers was revealed to be a druid curse? Or when he was beaten to death by Busta Rhymes? When he reinvented as a white trash vigilante in not one, but two Rob Zombie movies? And if you do remember all that, then you really are a fan. This time Laurie Strode has become a survivalist, spending her days perfecting her bunker, target shooting with her lever-action repeater, and drinking. Her granddaughter and daughter, however, aren’t quite as keen on spending every waking moment preparing to fight an unstoppable monster. Myers, meanwhile, has spent the last forty or so years in an institution, nurturing a latent rage and biding his time until he gets his chance at escape. And escape he does, killing his way through rural Illinois until inevitably running into the Strodes and beginning one FINAL, ULTIMATE battle against three generations of Strode women. Will any of our heroes survive? Will Michael be defeated, ONCE AND FOR ALL? Well, you already know the answer to that last one, don’t you? 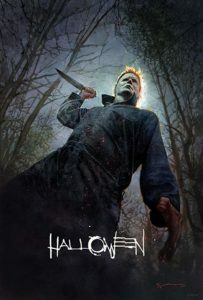 Because as long as there are people and money, butts and seats, they’ll still be making Halloween movies. Which, of course, means Michael Myers can never die, not really. And maybe that’s true of our American institutions as well… Maybe they just ebb and flow inexorably, like the tides, and sure enough, just when we think they’re on the wane they’ll come back strong, like Michael Myers rising from where he fell out a window, suddenly sitting up and lumbering towards us like some kind of glorious phoenix.